The Canadian Jamboree… every Scout and Scouter’s dream! Full of new adventures, cool activities, new friends, and badge trading; how could you not be excited! Even if you think you’re too old to attend, or you have already been to a Jamboree, there is always the opportunity to become an Offer of Service (OOS) and staff the camp. You can help with the rock climbing wall or be a lifeguard… whatever floats your boat! I attended the Canadian Jamboree in 2013 in Sylvan Lake, Alberta, and it changed my Scouting life. I met so many new people and got to try lots of different activities. I got into the addictive hobby of badge trading and now every Jamboree that I attend I continue to grow my collection. I also got to try zip-lining and rappelling for the first time, which was an amazing experience for me. Having just entered Scouts at the age of 11, I was bewildered by the amount of things to see and do at a camp like this. There was a talent show with singers and dancers, and a fuzzy mascot who came around to every camp to give out hugs. There were also tons of opportunities to get even closer and create stronger bonds with the members of my Scout Group. We even met with a Group that we had been emailing with for the past month before the Jamboree through a pen-pal program; we spent a whole night with them talking and dancing! With all of that in mind, the best part of the journey is how you get there; I had a blast on the bus-ride to the Jamboree. It took 24 hours from Vancouver, British Columbia, to Sylvan Lake, so we did a bunch of fun stuff like watch movies, listen to music, and play cards. We camped in Golden, British Columbia one night before the Jamboree and we were one of the first Groups on the site the next day. We set up our camp and took a long walk around the campsite. There were countless Volunteers and OOS who spent the weeks and months before the Jamboree at the site planning and preparing everything; It was amazing to see what they were able to achieve. After any Jamboree my Group goes to, we have this feeling of emptiness in our hearts because the memories and time we spent at the Jamboree was so amazing that leaving it is truly hard. My Scout Group calls this feeling PJS (Post Jamboree Syndrome). We get over this feeling by getting ready for our next adventure, which is always right around the corner. If your Group is interested in attending a Jamboree, consider joining thousands of Scout aged youth (11-14 years old) from across Canada and around the world at the Canadian Scout Jamboree 2017! 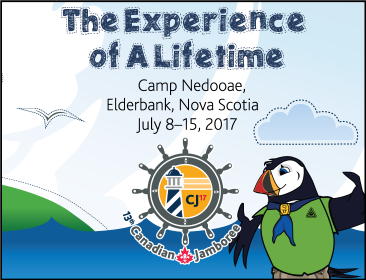 To learn more about this fun-filled week of adventure happening July 8–15, 2017 at Camp Nedooae in Nova Scotia visit, Scouts.ca/cj17 today.